UPDATE: Ten Harker teams were named top five CCS Scholastic Championship Teams for spring 2014. The awards recognize the five varsity teams with the highest collective grade-point average of all teams competing in that spring sport. Harker is in the top five for every sport in which we field a spring team – quite an achievement! Harker took top honors among golf teams (details below). The full press release and list of award recipients is appended to this post. Go Academic Eagles! Track and Field: The track and field team competed in the league finals on May 17, where freshman phenom Niki Iyer became the new league champion in both the 1600m and 3200m runs! She easily won the 3200m with a time of 11:15.15, and nearly set the league record in the 1600m, missing it by just 0.05. Meanwhile, senior Wei Wei Buchsteiner became the league champion in the high jump, setting a new Harker record of 5’9″ – a foot better than the previous record. At the event, freshman Winnie Li placed fourth in the 100m hurdles, also setting a new Harker record. Senior Arjun Kumar placed third in shot put and fifth in discus, while junior Sriv Irrinki finished in sixth in the 100m and sophomore Alex Dellar came in third in the 800m. At the junior varsity championships, freshman Davis Dunaway won four events while freshman Misha Ivkov placed in the top six in four events en route to the JV boys winning the team championship! These performances catapulted Harker’s athletes into the CCS preliminaries on May 24. Iyer led the first six laps of her meet en route to finishing second and setting a new Harker record. In her second semifinal, Iyer started off in the lead, then “stretched out the field with a 5:23 first mile,” said Dan Molin, athletic director, whereupon “only three other runners stuck with the young Eagle in the 22 runner field.” After that, Iyer “survived several moves past her in the last 800m before running a personal best 76-second last lap to hold on to her second place run and the third-best time of the night.” Iyer will race in the CCS championships Friday night at San Jose City College, starting shortly after 8 p.m., so come on out and cheer her on! Swimming: Junior Aaron Huang made the CCS finals after placing 14th in the 200 IM and 12th in the 100 breaststroke. Senior Kimberly Ma placed 14th in the 500 freestyle. Among 1 meter divers, junior Stacey Chao placed 35th out of 51. Golf: Last Friday, Shrish Dwivedi, grade 11 – who led the Harker team in its first-ever league championship, was co-league MVP and led the team to a best-ever sixth place finish in all of CCS – competed in the Future Collegian World Tour’s (FCWT) National Championship at the PGA National Course in Palm Beach Gardens, Fla. There, he received the prestigious FCWT All-Academic Team and First Team All-FCWT award, becoming the only male to receive both the academic and athletic honors. 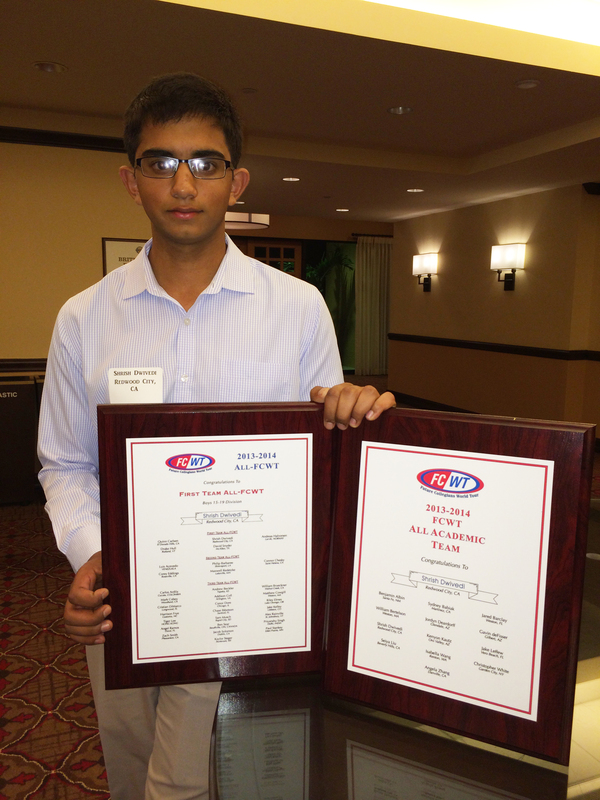 After three days of competition, Dwivedi brought home a top-three finish trophy in an international field of about 140 players. Congratulations, Shrish and GO EAGLES! The Central Coast Section of the California Interscholastic Federation is proud to announce the recipients of the 2014 Spring Season Scholastic Championship Team Awards listed below. These awards, instituted by the CCS Board of Managers in 1985, recognize the top five Varsity teams, from each Central Coast Section sport, with the highest collective grade-point-average of all teams competing in that sport during that season of competition. The student-athletes involved have achieved distinction in the classroom, and at the same time, have committed themselves to participation in interscholastic athletics. Their academic performance is yet another indication that such athletic participation enhances classroom activities. A team certificate and individual certificates of commendation will be presented to each school of each individual sport.